My own adventure wouldn’t be termed ‘extreme sport’, or particularly dangerous or wild. However! It involved heights, dry rocky (narrow) pathways, heat, and the bloody climb back up. 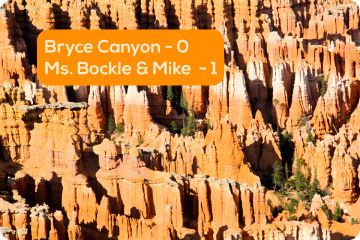 Mike and I went to Bryce Canyon in 2011–yep, my adventure wasn’t all on my own: we were there for each other. 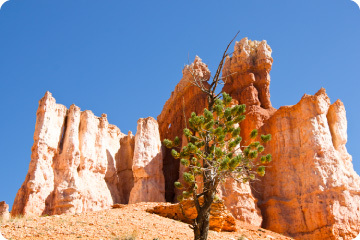 When we went to Bryce, we didn’t talk about walking any trails; we just planned to take tonnes of photographs. But when we got there, we looked at the hiking possibilities, and one of them was highly recommended as the best ever with spectacular views–sounded quite doable! Off we went with our flasks of water, and me with a wide-brimmed hat. The trail down had endless switchbacks, tiny tiny rocks to slip on–and brilliant vistas all round. 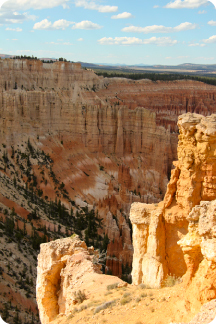 Instead of looking down on the formations and hoodoos from afar, we got closer and closer to them as we descended. Actually got to touch and smell them. Didn’t need the telephoto lens anymore. To be honest, much of the time we both were concentrating so hard on not slipping on our respective asses that we forgot to focus on why we were engaged in the activity. Then we got to the bottom: breathing easier, swaggering around, taking photos of the canyon the opposite way round–looking up, with the bright blue sky providing an awesome background. Little did we realize just how hard the trip back up would be and I discovered that Mike had an even greater case of vertigo than me. There were other people on the trail and going up the switch backs, the middle of the trails would be in the bright hot sun, the corners in the shade–with people huddling together in the shade trying to cool off, getting ready to get back to the hot slippery rocky trail. Whenever there was a wall Mike would hug it, reluctant to let go. People would come upon us; one lady in particular started talking loudly about how brave Mike was, having vertigo and all, to go on the trail, overcoming his fear; her own dear friend just couldn’t do it and stayed behind, but how awesome to fight this fear of heights, blahdee blahdee blah. Mike acknowledged her attempt at conversation with a weak grimace, so getting nothing out of him, the lady departed. What seemed like hours later, we reached the top, and stopped to rest on some benches. Now: would I go on that trail again? Yeah, I think so, but maybe during a cooler time of year, and again definitely would not go it alone. Sharing the joy and the pain is part of making the memory special. Do I think any EXTREME sporting adventures could be in my future? Maybe…I’d like to take a canoe trip down the Zambezi River! For now, I’ll be taking risks in some aspects of my life; but not so much the physical ones.